This 20x20 two-story log cabin has running hot and cold water to a large kitchen sink and front-loading washer and dryer. 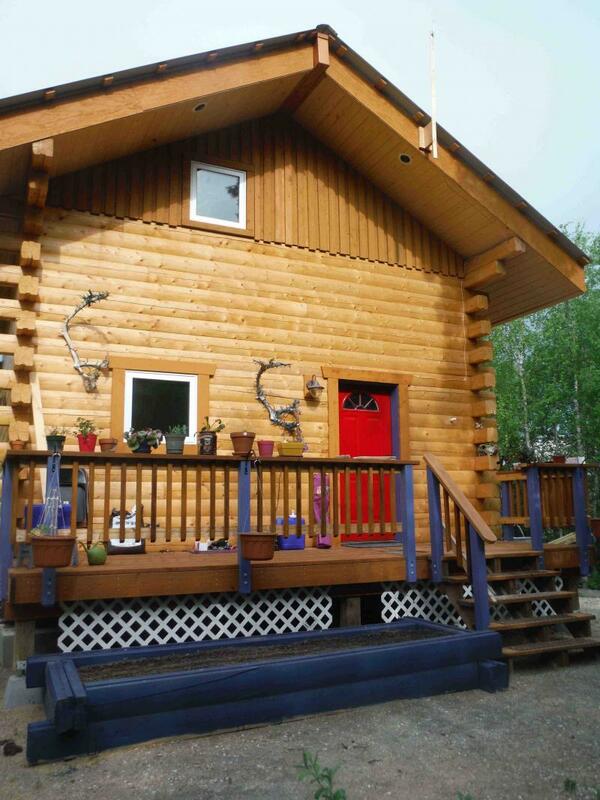 The cabin is located in beautiful Goldstream Valley, just six miles from the University of Alaska Fairbanks and adjac﻿ent to bike paths and an extensive trail system. * Two-story, 20x20 cabin with large deck. Total interior living space is 800 sq. ft.
* 92 percent efficient Monitor oil heater with 300 gallon fuel tank. * Triple-pane Northerm Low-E, argon-filled windows, approved by the Alaska Cold Climate Housing Research Center. Insulated steel entry door. * Heat Recovery Ventilation (HRV) system to optimize air quality. * Hot/cold running water to large kitchen sink, fed by 165 gallon water tank, pressure tank/pump, and 20-gallon electric water heater on a timer. * Front-loading washer and dryer. * Heat-traced and foam-insulated drain pipes mean no slop buckets! * A water tank for the renter's vehicle is provided to pick up water from Water Wagon or other local provider. A water transfer pump and hose is provided to transfer water into the cabin's water storage tank﻿. * Outside (summertime only) water spigot. * Excellent cell phone reception. Land phone line, satelite TV dish, Internet ready. * Lighted outhouse, with regularly pumped and cleaned septic tank. * Private parking with winter vehicle plug-in on a timer located inside the cabin. * Raised garden bed and hanging flower boxes. * Snowplowing and hardpack removal provided.